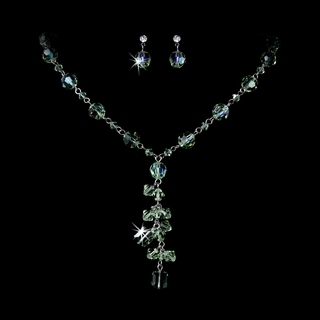 Featuring peridot green Swarovski crystals in a beautiful drop design, this silver-plated necklace and earrings set will be one of your favorite pieces of jewelry for years to come! Size: The necklace measures 14-1/2" in length with a 3" extender, and a 2-1/2" central drop. The earrings measure 1/2" in length.